Polish women sent as forced labor to Nazi Germany during World War II is an under-reported war crime inflicted against Polish civilians by Germany. Germans considered Poles to be untermenschen or subhuman, only suitable for slave labor to the superior German race. Until I encountered the book Wearing the Letter P: Polish Women as Forced Laborers in Nazi Germany, 1939-1945 by Sophie Hodorowicz Knab (Hippocrene Books 2016) I had no idea of this facet of World War II. An estimated 1.7 million civilians were forced into slave labor and sent to Germany, the majority of them young women. Knab focuses on Polish women, some as young as fourteen, sent to Germany as forced labor during WWII. Young Girl Wearing the “P” Patch as Forced Labor. Credit: Sjam2004, Creative Commons. She makes extensive use of letters written home by the women and includes a lot of historical research and information. The book methodically covers a myriad of topics of daily life. Various chapters address roundups, transports, hard labor in agriculture and factories, health, and one aspect unique to women: pregnancy and childbirth. She also addresses the mixed fates of Polish children born in Germany. Knab said she not only wanted to document the story of the slave labor experience which her mother had endured, but to give a voice to the women who endured so much, and received so little recognition. Growing up, Sophie never really understood the historical context of what her mother had been through. Badge Polish forced laborers were made to wear. Credit: Polenabzeichen, Sjam2004, Creative Commons. Information on life and death in concentration camps has been well documented. Yet there was no literature about the forced labor aspect in English that she could find. She remained curious, but life moved on. One day Sophie was looking in a history book and saw a picture of a trolley in Warsaw with the letter “P”. She would learn the “P” meant the trolley was restricted to “Poles only” after Germans took up residence in the former capital city. It was a discriminatory tactic similar to forcing all Jews to wear the Star of David. 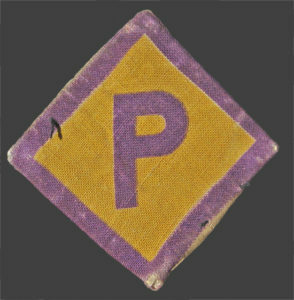 Poles forced into slave labor were required to wear the letter “P” pinned to their clothes at all times. 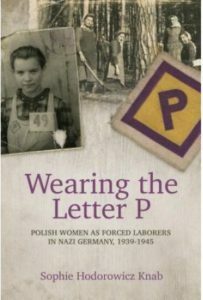 Knab spent fourteen years writing Wearing the Letter P: Polish Women as Forced Laborers in Nazi Germany, 1939-1945. 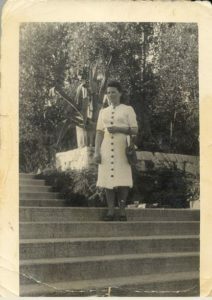 Jozefa Zalewska Hodorowicz, Krakow 1943, prior to deportation to Germany. Photo courtesy of Sophie Knab. The book is dedicated to her mother, Jozefa Zalewska Hodorowicz, who was survived two years of forced labor in Germany from 1943-1945. Sophie’s oldest brother was born in a slave labor camp in Unterluss, Germany during the war, and somehow he managed to survive. Sophie and two more brothers would be born after the war in camps for displaced persons. After the family immigrated to the United States when Sophie was six years old, they were often referred to derogatorily as “DPs.” Fitting into the American community was a struggle. Many Americans, who had no knowledge of Poland’s fate, didn’t believe Jozefa when she said she had been in a slave labor camp. Ultimately, Knab wrote the book she could not find. 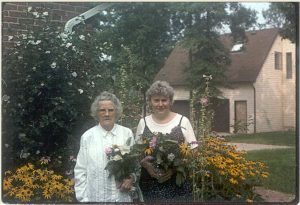 Sophie Knab with her mother Jozefa on the Feast of the Assumption, circa 1990s. We are fortunate that she is fluent in Polish as she was able to take on the laborious task of translating letters, documents, and other original resources from Polish to English. The book reads like a well-researched resource based on many women, rather than a single storyline or novel, even though there is a continuity of letters from several of the same women throughout the book. As such it fills an important niche of valuable information that a reader can pick up and turn immediately to key issues. For more information on Sophie Horodowicz Knab and her books visit sophieknab.com. This entry was posted in Poland, Polish History, World War II - Europe by Katrina Shawver. Bookmark the permalink. As usual, you find these great nuggets of information that fill out the spaces of the unknown. This is also timely with the publication of your new book about a Polish gentleman. Looking forward to seeing you this weekend at the Tucson Festival of Books! That’s a very interesting topic, Katrina. We recently acquired a (fiction) book for my school library geared toward 9-12 year old readers titled “Making Bombs for Hitler”, by Marsha Forchuk Skrypuch. 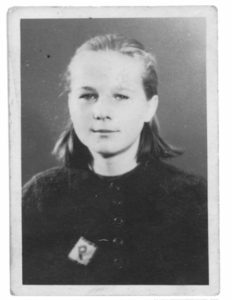 The description is as follows: “In 1943 ten-year-old Lida is torn from her home in the Ukraine, separated from her little sister Larissa, and sent to a slave labor camp in Germany, but when she is moved and set to making bombs she sees a way to strike back at the Nazis”. I appreciate that the author introduces younger readers to the fact that many youth were involuntarily sent to labor camps during World War II. I’m so glad you found that book. It’s a piece of history I wasn’t aware of. And yes, often the girls and women were forced to work in armament factories just as the description says. I’d be interested in your thoughts if you preview/read it. Thanks for sharing this information. Few people today realize the enormity of the slave labor policies of Nazi Germany. With almost all able bodied men conscripted for the military, German women and captured East European slaves filled the need for manual labor. The Poles were especially hard hit twice because those who were abducted from the Eastern part of Poland had nowhere to return to after the war. The Russians took that part of Poland and refused to let the Polish slave laborers return. Thus they and thousands more from what became de facto Russian territory behind the Iron Curtain were designated Displaced Persons. Thousands of them languished for years in prison camps set up in the Western part of occupied Germany until they could find sponsors who would help them gain their freedom.